Discussion in 'Beginners/FAQ' started by Abhimanyu, Apr 2, 2010. 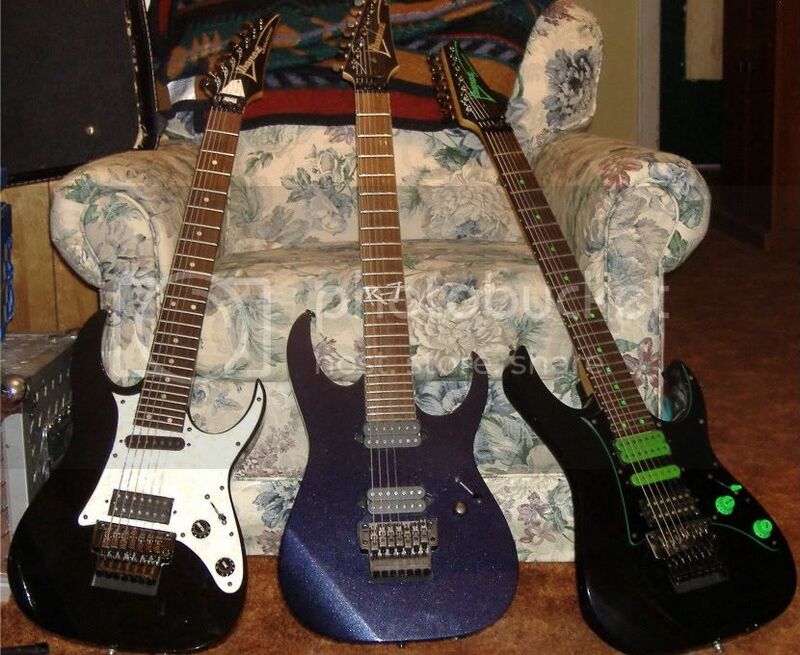 Im really confused between the two..
Ibanez UV777 or Ibanez K7?! i mainly play metal and some blues, rock and jazz as well.. I need a guitar catering to all these styles. I know tht the K7 has a mahogany body and the UV is basswood. If the K7 wasnt so bland-looking, there probably would have been no confusion ever! Raphomet_, Evergrey and Leetlord like this. the k7 has a rediculously nice shreddy neck, its reminiscent to me of the older UV's, plus it has a mahogany body, which i personally prefer tone-wise. my two dream guitars. I just play the K7rb, and I love it, the mid gain pick ups are perfect for a lot of stules, and if you need more gain...add a metal pedal. the neck is awesome, and the finish....nom nom, the pearl binding and the sparkle blue, just love it. a like the gray more. Damn.. an Ibanez 2027x is wot I really want man! Anybody knows anyone sellin'? But I'd definitely vote K-7. The stock pickups aren't the best, but they are good enough, and you can always swap them out for something better later on. The neck has a slightly rounder and more comfortable profile than the UV, which has a flat back and quite pronounced shoulders. Both are excellent guitars, but for playability and the sheer fact that it's mahogany, the K-7 wins it. I doubt I will ever sell mine, simply because there is no production 7 that could replace it and fill its boots, other than another K-7. both! or try a custom ET guitar! Really though it a tough choice. IMHO older UV> K7> newer UV. Hope it helps, good luck, happy hunting! Definatly go with an old Universe, IMO they cant be touched by any mass produced 7 thats out today. The K7 is seriously nice too though, i guess it would depend on the type of sound your going for, but all i can say is the Old UV necks are unbeatable. Damn you ED for such a brilliant collection! vs A very good condition K7FB for $1200 with Dimarzio DropSonic and AirNorton in the neck included!! if i were to choose i would go with the universe... its lighter, better stock parts, higher resale, but it has to have the pickguard removed to change pickups if i have that right... body binding, and inlays and also its a steve vai... major points there... k7 is darker sounding, rear routed, heavy, no inlay markers, no binding, no steve vai stamp of approval... go with the universe!!!!! MINT condition UV7BK - Green dot! for $1550! A very good condition K7FB for $1200 with Dimarzio DropSonic and AirNorton in the neck! Wow mint UV vs. K7 with those pickups? No matter what you pick you'll always wonder about the other. ^^ you got that last one SPOT ON ed! Any suggestions .. I think I would want the thick tone and the shredability of the K7... thats considering the UV 7 doesnt hav a tone so thick n meaty.. is it drier than the K7s tone?! I have the same K7 as posted above but I replaced the pickups with Barekbuckle Painkillers, I have honestly never heard a thicker, tighter and ballsier guitar sound in my life. Mahogany with a bolt on neck combined with tight, upper mid oriented pups just delivers such a phenomenal 'oomph' with warmth that I cannot imagine basswood being able to do the same. K7 for sure. I don't like Korn at all but if you ask me guitar beats UV in terms of tone, reliability and looks . I plan to get one soon and 1st thing I'm gonna do is sand down the body and stain the top + tung oil. Simple and killer. 2nd (as above): Painkiller in the bridge.